The Save Your Bar information page. Are you currently operating a bar that is losing money to the point it is threatening your financial security? 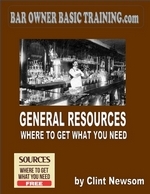 Did the bar business turn out to be much more difficult than you ever imagined? Has what you thought would be an exciting adventure turned out to be a never-ending nightmare? These are all awkward questions, but there’s more. Are you continuously behind on rent and payroll? Are your suppliers forever trying to collect on old invoices, even cutting you off at times? Is the electric company always at the back door with a cut-off notice? Are all of these things happening despite having a good crowd at your bar? If you see your situation here, it is unlikely things will get better by ignoring the problem. Ignoring the problem only makes failure more likely, because these problems do not cure themselves. Due to inexperience, bar owners in this situation, often have no clue as to what to do, and become paralyzed by fear and indecision. Happily, there is a way out. Sadly, there is no magic formula. Each situation is different in terms of the problems and the severity of those problems. All failing bars, however, have many of the same problems in common with each other, and one in particular. All of the problems in each failing bar can be traced back to the owner, and how strong of a commitment he has made to success. Things he has done and things he hasn’t done. Successful bars never have and never will, run themselves. If you are ready to take the first step in turning your bar around, consider “Save Your Bar”. But purchasing the manual will not save your bar unless you make a strong commitment to follow the guidelines laid out for you. Turning a bar around is not an easy thing to do, but it is impossible without that commitment. You must have a burning desire to succeed. If you want a shot at realizing the dreams you had when you first decided to go into the bar business, order “Save Your Bar”. Don’t waste any more time. Click on the cover link below to order the version that will best work for you.